This is great. Tommy Chong gave HERBREVIVAL's Sean Evans a tour of his Chong's Choice marijuana growing facility. LOS ANGELES, March 7, 2016 /PRNewswire/ -- Get ready to laugh with GOTHAM COMEDY LIVE, as the popular AXS TV stand-up series returns for its sixth season, premiering on Thursday, March 31, at 10pE. The weekly program puts the spotlight on some of the country's top comics, as the favorites of today and the icons of tomorrow take the stage to deliver humorous sets live from the world-famous Gotham Comedy Club in New York City—which celebrates its 20th Anniversary in May. Each episode of GOTHAM COMEDY LIVE is hosted by a different all-star entertainment personality and the season six premiere kicks off with the iconic David Hasselhoff serving as emcee. Hasselhoff will introduce the night's comics, bringing along his trademark wit and self-deprecating charm as he promotes his new AXS TV comedy series HOFF THE RECORD. In addition to Hasselhoff, the new season welcomes several all-star hosts to the show, featuring "The Queen of Mean" Lisa Lampanelli (April 7); blonde bombshell Pamela Anderson (April 14); Soviet sensation Yakov Smirnoff (April 28); beloved big man Brad Garrett (May 5); Kentucky-fried comedian Norm Macdonald (May 12); fan-favorite Cheech Marin (May 19); SATURDAY NIGHT LIVE standouts Cheri Oteri (May 26) and Jon Lovitz (June 9); and UNDATEABLE star Chris D'Elia (June 23), among others. "GOTHAM COMEDY LIVE is the ultimate series for live comedy connoisseurs," said Michele M. Dix, AXS TV's senior vice president, programming and development. "This season is packed with some of the industry's most promising comedic talent, and hosted by some of entertainment's biggest names as we celebrate the return of this AXS TV comedic staple." Since 1996, the Gotham Comedy Club has been the premier destination for both up-and-coming comics and legendary veterans to come and hone their craft on one of the country's most esteemed stages. Over the years, it has hosted top-tier talent such as Dave Chappelle, Lewis Black, Amy Schumer and Jim Gaffigan, while serving as the backdrop for countless TV shows and films, including the Jerry Seinfeld documentary COMEDIAN; as well as Larry David's CURB YOUR ENTHUSIASM; and the long-running stand-up competition series LAST COMIC STANDING. To date, over 100 episodes of GOTHAM COMEDY LIVE have been produced for AXS TV. GOTHAM COMEDY LIVE is produced by Killer Bunny Entertainment and Sugar Hit Entertainment in association with Gotham Comedy Club. Each Thursday the audience is given a front-row seat at the legendary Gotham Comedy Club in the heart of Manhattan for the only live, unedited, uncensored stand-up comedy available on television. The series features the biggest names working the circuit, along with up-and-comers sure to be the next thing. AXS TV is the cable industry's leading general entertainment network for live event programming. Launched in July 2012 by visionary entrepreneur Mark Cuban, AXS TV is dedicated to providing groundbreaking music programming, stand-up comedy performances from today's top comedians, and hard-hitting mixed martial arts promotions. The network's franchises include THE X FACTOR UK and NASHVILLE; as well as original programs such as THE BIG INTERVIEW with Dan Rather; ROCK & ROLL ROAD TRIP WITH SAMMY HAGAR; THE WORLD'S GREATEST TRIBUTE BANDS; GOTHAM COMEDY LIVE; AXS TV FIGHTS; and INSIDE MMA. Tommy Chong debuted his new podcast this past week on CANNABISRADIO.COM. Tommy mentions seeing Johnny Carson after he retired. He had long hair. It was in the men's room of a Malibu restaurant. Carson was putting water up his nose, trying to breathe. "He was in there snorting water...cleaning the cocaine out of his nose" His face was under the water tap. Carson "looked like Howard Hughes." TOMMY CHONG, best known as one-half of the iconic comedy duo CHEECH & CHONG, is now hosting a self-titled cannabisradio.com podcast, which debuted on MARCH 2nd. New episodes of “The TOMMY CHONG Podcast” will air WEDNESDAYS at 9p ET on CANNABISRADIO.COM, and via the TUNEIN RADIO and SPREAKER RADIO apps. 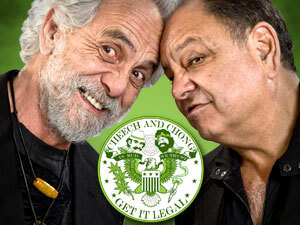 Archived episodes of “The TOMMY CHONG Podcast” can be downloaded on-demand from iTUNES, STITCHER, iHeartRadio and at www.cannabisradio.com. Tommy mentions repeatedly that Cheech Marin doesn't like him. He discusses about what a disaster it was presenting at the 1984 Academy Awards. Tommy says he saw Johnny Carson after he retired. Carson had long hair and was in the men's room putting water up his nose...to breathe. He couldn't breathe because Carson was washing out the cocaine from the night before. Krishna Andavolu, host of VICELAND's show WEEDIQUETTE, met Tommy Chong in his kitchen to show how he treated his cancer. Yes, they both use THC suppositories in this video.